Thank you, President Diver. And thanks to you, the members of the class of 2008, for inviting me here today. It’s a pleasure and a real honor to share this day with you, and with the rest of the Reed community. So now that you’re graduating, my fellow Reed alumni have authorized me to let you in on a secret. Old Reed, that fantastic place you’ve heard about for the past four or so years, the place whose threshold you’re now standing upon, has always been pretty much the same place you know today. You have a few—okay, more than a few—new buildings. The SU, I have to say, smells significantly better than it did twelve years ago. And in my version of Old Reed, at least, there were no heated disputes over cell phones in the library. But I think you and I share a lot of memories: of caffeinated late nights in labs and at thesis desks, of seedy Reed houses, of scroungers and Picts and the joy of the thesis parade. And all the graduates who came before you know, better than anyone, just how hard you worked to earn your seat under this tent today. So if I can presume to speak for them, congratulations. Welcome to Old Reed. You’ve been here all along. While I was thinking about what to say today, I read a bunch of commencement speeches by a lot of impressive people. After a while I realized that, though they used different language, most of them said more or less the same thing. They advised their listeners to find what they loved doing and what they had a knack for, and use those passions and skills to try and better the world. Now, since I’m a Reedie, I’d approached this distinguished canon of speeches with every intention of rebelling against it. And my first thought was, “There’s no way I can say anything like that to these grads! These are Reedies! They’re trained to hunt down clichés and kill them!” But the more I thought about this advice, the more I realized that I’ve heard versions of it, over and over, from all the wise people in my life: Do what you love, and do it for others. And I realized that the real reason we commencement speakers keep finding new ways to repeat ourselves is not lack of imagination—at least, I hope not—but an awareness of the obstacles. We’ve all learned that while this may be the most important advice we can give, it’s also the toughest to follow. I mean, there’s a lot of pressure in the world to do exactly the opposite. Doing what you love probably means turning away from some much more reliable or glorious path open to you. It probably calls for more than a little financial creativity. It definitely requires extra doses of patience and faith. You often hear stories that follow a sort of Hollywood plotline: So-and-so struggled against obscurity and ridicule until—shazam!—their good ideas were recognized, and they changed the world. But what’s rarely mentioned is that lots of people with good ideas never get hit by this lightning bolt of recognition, and that many of us who do what we love, in the way we want to do it, continue to put up with a lot of teasing from the people around us. I speak from experience: I’ll bet you good money that within the past week, someone among my friends and family has shaken their head over my insistence on living with a composting toilet. But you Reed grads are at an advantage here. You’re weird. If you weren’t weird when you showed up on campus, you’re weird now. I don’t mean weird in the sense of, um, an original fashion sense, or a tendency to eat other people’s leftover lunches—though goodness knows there’s plenty of that around here. I’m not talking about superficial rebellion: Many of the weirdest people I know look quite conventional, and—parents, you may appreciate this—have degrees and jobs and normal personal hygiene habits. I’m also not talking about the sort of weirdness that isolates you from other people. All of us, especially those of us who choose unusual routes through life, need allies and mentors and partners. We need the family we’re born to, and the family we create around us, whether we’re finishing our thesis, building a house, or carving out a career. The kind of weirdness I’m talking about has to do with a willingness to learn the canon, then rebel against it. It’s about a quiet but consistent suspicion of what you’re expected to do, what you’re told is possible. It’s about a willful mishearing of the conventional wisdom. Reed attracts people with these qualities, and it gives you the extraordinary privilege—the really extraordinary privilege—of spending four years in each other’s company, when you get to challenge each other, teach each other, nurture each other’s particular weirdness. And that well-honed weirdness leads Reedies to amazing places. One of my fellow biology majors, now a doctor, founded, runs, and fundraises for a medical clinic in rural Borneo, where her patients earn credit for services by working to restore the forests nearby. One of my thesis officemates got his doctorate in plant ecology, then returned to live on his family’s ranch in north Texas, where he’s putting the principles of sustainable agriculture to work. Another friend, who wrote his English lit thesis on Oscar WILD, got interested in green building after graduation, and taught himself about the field. Now he’s working for an energy utility in southern California, convincing homebuilders to protect the climate. Two other friends are raising toddlers—one in the midst of medical school, the other as she finishes her first novel. These are all, in their own ways, weird acts, acts of irrational optimism. They’re also acts of compassion, with no guarantee—or even likelihood—of riches or glory or any sort of traditional success. They’re what helps convince me that, with apologies to Henry David Thoreau, in weirdness is the preservation of the world. My own training in weirdness led me to use my Reed biology degree to become a journalist. Journalism is one of the few jobs that allows you to be a professional amateur—a professional student, in a way—and because of that it gives you a very broad look at the state of the world. Since I write about science and the environment, my job is often to explain why the state of the world is not so promising. We know, with greater and greater clarity, that the climate is changing, that species are disappearing at ever higher rates, and that environmental destruction is continuing to cause enormous human suffering. To cope with this dire state of affairs, we need weirdness more than ever. The paradox I live with is that, although my job can be terribly depressing at times, it’s also a hell of a lot of fun. I’ve gotten to chase scientists through some of the most incredible spots in the Rockies, and I’ve stayed in a lot of questionable motels in a lot of fascinating out-of-the-way places in the American West and elsewhere. I’ve talked to people I’d never meet otherwise, and I’ve learned odd things that were never part of the Reed curriculum. And even though I’m often just extending the already long narrative of destruction and decline of the natural world, I can’t help but be inspired by the wit and courage and good ideas that I find in the process, ideas that, if helped along by a little weirdness, might give me new, more optimistic stories to tell. I think this sort of fun, fun in the most unlikely settings, is the real—and sometimes the only—reward of mustering the weirdness required to do what you love. When I graduated from Reed, a lot of people told me that the right thing to do was to be a research biologist. I liked science, I really did, and I had wonderful mentors in the department here. And I still have tremendous respect for researchers. But I suspected that I just didn’t have the single-minded passion science requires. I knew I liked writing, liked fooling around with words, but at the time I didn’t even know there was such a thing as science journalism—I just thought I had a bunch of interests and skills that had nothing to do with one another. So I was scraping by with seasonal research jobs, taking the GREs, casting about for other ideas, when I happened to come back to Portland for a visit, and happened to run into my former statistics professor, Albyn Jones. Many of you know Albyn from class or from juggling, I’m sure. I was telling Albyn about my troubles, and I was moaning and groaning a bit—I know he’s heard the same story from dozens of alums—and he thought for a minute and said, “Well, I’ve always done exactly what seemed fun to me at the time, and that’s worked out pretty well.” And I remember this very clearly, partly because my first thought was, “Wow, he did exactly what he wanted to do, and he did statistics?” But I took this advice seriously. I gave up the idea of being a research biologist and looked around for something that sounded more fun to me, and not too long after that I got an internship at this quirky newspaper called High Country News, which covers environmental issues in the American West. I’ve done a lot of different sorts of journalism by now, and I’ve found that every assignment has its share of hairpulling, but deep down I’ve been having fun since my first day on the job. Now, I won’t go so far as to say that everything Reedies do for fun has some socially redeeming value. But I think that a lot of it has huge power. So many Reedies have wonderful senses of curiosity and irreverence and intellectual adventure. Just consider a few of the things you’ve dug into this past year: the prospects for renewable power in China, the culture of Jamaican dancehalls, the art of investigative journalism in Russia, the literary tradition of dragonslaying—from Beowulf to Buffy—and something that one physics grad calls “quantum mechanical hoo-hah.” We need more people willing to put this sort of curiosity to work off campus—people willing to try weird things, willing to risk obscurity and apparent failure to help us see the world in new ways. I’ve started to think of that effort as the most serious fun of all. The last thing I want to say is that today, this morning, is one of those long moments when the uncertainty of life is impossible to ignore. Even those of you organized souls with firm plans for this summer, or next year—you have no idea what you’re getting into. And as I look forward to becoming a parent in the next few months, I’m right there with you: Those of you in the audience who are parents will nod your heads when I say, I have no idea what I’m getting into. And so I’m scared and excited, just like many of you are probably scared and excited. But one of the things I’ve learned from wiser heads in the last 12 years is that it doesn’t do much good to look for certainty. It always seems to work out better when you try to savor the adventure. So savor this day, savor this time with your families, savor the time that remains on campus with your friends. Savor your accomplishments, and the promise of adventure ahead. And when you head off campus for the final time as a Reed student, keep having fun. And, please, whatever you do, stay weird. Thank you. 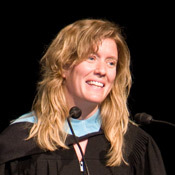 Read more about 2008 Commencement Speaker Michelle Nijhuis ’96.